What do I want to do? When do I want to do it? How well do I want to do it? Notice the common thread throughout each of the three questions? "...do I want to do...?" That’s because time management is all about making, organizing and executing choices. And you’ve always got a choice. You can’t actually manage time itself. What you really manage is your use of time, and that means constantly making decisions about what to do, when to do it and how well to do it. This is all about what to say 'yes' to in your life, and what to refuse, decline or let go. It applies to anything, from an on-the-spot snap decision, beyond even major potential life changing commitments such as a relationship or career, all the way to your core beliefs and personal values. Just like managing time, you can’t avoid doing it, so surely it makes sense to do it well? Your basic needs must be met to enable you to function -- these take up a sizable chunk of time each day. For example, the quality (and quantity) of sleep you get are dependent on several factors, many of which you can control if you choose to. You also have to decide how well to meet your current commitments. As long as you’re prepared to accept the consequences of your actions, you’ve always got a choice about how well to do what you ‘have’ to do. Then you need to decide how much time to give to unstructured activities, and how to spend that time. This doesn’t necessarily happen after you’ve met your basic needs and commitments -- these can both be cut short or neglected because you decide to give more time to what you want to do. How congruent are your tasks, projects, actions and habits with your roles, goals, values and beliefs? Do your beliefs define your roles and goals? If so, do your actions support them? But the real power for deciding what to do comes from within. Do you believe in what you’re doing? Do you even know what matters most to you? Make it a priority to do so. When you do, every role, goal, commitment, project, task, habit or action will make more sense and have so much more purpose and meaning. 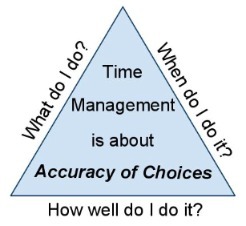 The second part of my definition of time management is about organizing your time -- choosing when to do something. Here’s where you really benefit from knowing how to use time management tools, skills and strategies. This can be hard -- when you want to do something may not actually be the best time to do it. Willpower and self discipline are the key to delaying the gratification of Doing It Now. What’s wrong with Doing It Now? Reacting to things means other things get pushed aside. Things control you rather than you controlling them. (email is a great example of this). Try out some time management systems to help you get organized and do things when it’s most appropriate to do so. Planners, diaries and schedules are essential for organizing what you’re doing and when. Once you’ve decided what to do, work on getting better at knowing when to do it. There is no formula for doing this. It just takes practice. Gradually, though, you’ll get better at knowing what to do when. This is the the third part, the definition of time management that determines the degree to which you apply yourself to something or someone. Some things in life are started and finished in one go such as making a drink or a short car journey. Other things can take longer -- a report, a project or even your health and relationships. As well as deciding when to do it, you have to decide how long and how well you are prepared to do something for. Understanding the Pareto Principle is important if you want to put more accurate and appropriate amounts of time and energy into whatever you deem is worth doing. Your decisions about what to do - are they an accurate reflection of your highest values and deepest beliefs? Your decisions about when to do things - are you organizing your life so that you do things at the optimum point in your day, week or month? Your decisions about how to do things - are you able to do things to the degree to which they truly deserve to be done? This is an ongoing challenge, one that never goes away. Want TMS to Come to You? Subscribe for time management ideas, articles, tips and offers, direct to your inbox on the first Tuesday of every month. Here's a taste of what to expect. I understand that you will use my information to send me Time Management Success. Your e-mail address is totally secure. I promise to only send you information on Time Management Success, and you can unsubscribe at any time. Is Poor Time Management at Work Holding You Back? Copyright © 2009-2019 Tim Wilson. All Rights Reserved.